These are two words that mean a lot of people. When someone does something nice for you it’s common courtesy to say thank you. In most cases people rip off the phrase without thinking twice. Sometimes we’re so used to saying it that we get into the habit of not saying it at all because we assume the thanks is implied. This can happen with friends or with business partners or customers. If you’re looking to say thank you business partners or customers, a blog can be a great way to broadcast your appreciation. There are good reasons for saying thank you. It will make you feel good and, more importantly, it will make the other person feel good as well. In adults, the keeping of gratitude journals led to overall happier thoughts. Not only were the journal keepers in a better mood, they also were more likely to to report having helped someone with a personal problem or offered emotional support to another, suggesting that the positive affects of gratitude expand outward. Thank you is good for your health. It’s a great way to relieve stress and actually put you in a better mood. These are great tips. 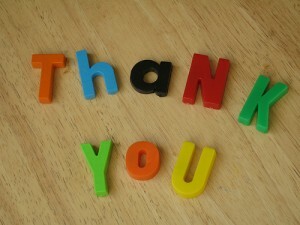 Read the entire article for full descriptions and advice on how to say thanks. Here’s a good example of one publication saying thanks to their readers. The thank you blog post doesn’t have to be long. The thank you does have to be genuine and there is no way to fake this. You have to think about the specific reasons you are thankful for your readers whether that is your customers or partners. A common example of a good time for a thank you is the end of your fiscal year. Your company could have had a great year. Maybe you didn’t have the best year, but things were better than expected. This is a great time to thank customers. You can share specifics – as much or as little as you are comfortable with – and really make your customers feel connected to the company. People generally like to be part of something that is successful. When you have success you likely realize it’s the work of many people. You can thank you employees, partners and customers. A blog post for your customers could include the specifics of the successful year. Share the story of the business from the previous year. Thank the customers for being part of that success. Be sure to tell them exactly how they had an impact on things. Even share some insight into what will happen with the business in the future. Make it personal, but keep it professional. I like that tip from the above article. You want to make people feel like you’re an actual person with feelings and that you genuinely care about them. Now I have to say thank you to the clients of Ghost Blog Writers. The company is still new, but things are going well. New clients are coming on board and those that have been with the company for the past year have been amazing partners to work with. Blog posts have been successful and it’s been great to work with honest and caring people. That has been something that is most rewarding. I love working with great clients. You have been friendly, caring and enthusiastic about the blog posts being written at Ghost Blog Writers. I’m looking forward to many great years ahead at Ghost Blog Writers and I’m excited about where the business is heading. That excitement is a direct result of working with great clients like you. The writers at GBW are awesome. They are some of the best researchers I know. They are passionate about delivering quality blog posts that are original, informative and even opinionated when necessary. It’s great to work with individuals that are self-driven and focused on doing quality work.